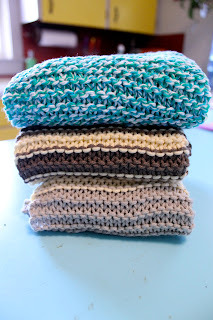 Bossy Italian Wife : Stuff I Use: Knitted Dish Towels + Giveaway! Hubs is out of town, so the youngin' and I will be dining out! Mmm! I need to try this! Country Fried Steak with mushroom gravy and beef rice with a salad! These are a great idea! I've been craving salad! So tonight I'm doing a simple fix with all my favorites! Spinach salad and romaine mixed. Slices of aged Sharp Vermont white cheddar, radish, granny smith apple, pear, bacon and seasoned grilled chicken! Everyone can choose their own dressing and all I have to do it throw it together. Yum!